NOTE: Voting for the 2015 “Survivor” Hall of Fame has ended. Be sure to check back Monday, December 14, 2015 to meet the first new member. ANOTHER NOTE: XFINITY TV is the place to go for “Survivor: Second Chance” coverage. We’ll have Power Rankings with “Worlds Apart” faves Jenn Brown and Max Dawson, every Wednesday evening we’ll bring you a recap of the most recent episode, and every Thursday you’ll be able to watch the previous night’s episode and read an interview with the eliminated contestant. Be sure to follow me on Twitter (@gordonholmes) for immediate updates. The “Survivor” Hall of Fame is proud to have 2010 Inductee Parvati Shallow as a member of the Executive Voting Committee. As a member of this exclusive committee, Parvati (along with Host Jeff Probst and other “Survivor” luminaries) has accepted an awesome responsibility. The committee’s votes will make up 50% of the final tally for entry into the prestigious Class of 2015. The other 50% will come from “Survivor” fans like you. Tyson Apostol – (“Survivor: Tocantins,” “Survivor: Heroes vs. Villains,” and “Survivor: Blood vs. Water”): Say what you will about this “Survivor” goofball, but Tyson belongs in the Hall of Fame. When I played with him on “Heroes vs Villains,” he made a hasty and foolish mistake that cost him the game. On his third time around, Tyson had clearly learned from his former blunders. Playing with his girlfriend Rachel on “Survivor: Blood vs. Water” brought out never-before-seen facets of his personality. Tyson can be serious? Tyson loves someone so much that he cries for her and commits to do whatever it takes to win, not for himself, but for Rachel? I love Tyson for his wacky sense of humor and for the great depth he showed us in his winning season of “Survivor.” And, now he’s a dad! Can you believe that? Eliza Orlins – (“Survivor: Vanuatu” and “Survivor: Fans vs. Favorites”): Eliza is the force of nature who coined the infamous phrase “It’s just a (expletive deleted) stick!” Though not yet a “Survivor” winner, this woman is a ferocious competitor and a larger-than-life jury member. *Cue the eye-roll* *Cut to gaping jaw* For those reasons, she deserves Hall of Fame recognition. Each time Eliza graces our screens for a season of “Survivor,” her presence is felt…intensely. What she lacks in social grace, she makes up for in grit and determination. She’s tough as nails and will fight to the end. Then, when her torch does get snuffed, and she takes her place in the jury, you know she’s going to use her power and influence to ensure the best player wins. Benjamin “Coach” Wade (aka The Dragon Slayer) – (“Survivor: Tocantins,” “Survivor: Heroes vs. Villains,” and “Survivor: South Pacific”): You know this whole “Survivor” yoga craze? Well, Coach may not have started it all, but he sure did make it cool. This man rocked the “Survivor” world with his feathers, coachi and grown man tears — how could we not fall in love? His strategic game in “Heroes vs. Villains” was tragically flawed; it’s never good to go after me from day one. But, he rose to the occasion his third time around, becoming a father figure to his flock and securing a spot in the final three. Sadly, Coach missed out on winning the game, but he still wins at life. Parvati Shallow: Hali’s really cute, she’s smart. She has a good perception of other people. I would definitely work with her and trust her in my alliance. As far as getting to the end with her, I think she’d be a clear threat to win the game. So, I’d take her to the end, but not all the way to the end. Gordon Holmes: I’m really on the fence about her. This cast wants to make moves and I’d have to convince her that the best moves for her would involve keeping me around. We’d need a common enemy instead of just picking off random people we’re not aligned with. I guess the fact that I’m so wary of her speaks to how much respect I have for her potential. Jeff Probst: So much potential. She’s one of my favorites on this season. When she walked in the door I fell in love. I like the underdog. Me and her to the end. Probst: My concern would be that she’s going to change her mind. She’s going to get a better offer. She might think it’s fun to vote me out even though it makes no sense. I wouldn’t mind stabbing her in the back. I like Jenn. I’d love to be on a boat that she’s sailing. She’s a blast. Shallow: (Laughs) I agree with a lot of that. I think Jenn is a bit of a wild card. You want to trust her, you want to like her. She’s definitely incredibly likable. I’d like to play the game with her and hang with her on the beach. But, I think she could go whichever the wind blows. I could see her being manipulative and the kind of person who wants to make a big move. Make a big splash. Make a name for herself. Holmes: I really like Jenn. She is a mega-ton of fun. But she is scary. I could see myself being very paranoid whenever she wanders off to get water. I’d work with her, but I wouldn’t make any long-term plans with her. Fortunately, I could see her being a juror that would respect and reward you if you cut their throat. Probst: I’m not going to align with Joe. He’s just too young for me, I don’t trust his life experience. Way too likable and good-looking for me to give him a chance to go deep in the game. I’m going to use him until I can get rid of him. Shallow: I disagree. I really like Joe and I don’t think he’d be able to beat me at a final jury. I’d take him all the way to the end. And I think that he and Hali would be a good combination. I’d work with those two. Something about Joe makes me really want to trust him. Holmes: Joe is my dream alliance. Golden boy, challenge stallion, I’d be no threat in his eyes. He can take all of the attention off of me and what I’m doing. I’d just have to get rid of him in the final stages. No way I’m sitting next to this guy at the end. And if the tide does turn against us, him getting voted off would give me time to scramble. Shallow: Nina reminds me of Kathleen Sleckman from “Micronesia.” She’s one of those people I think wants to be liked. So, if she feels comfortable, and liked, and valued, and included, then she can be an asset and a vote. But as far as relying on her for strategic plans? I wouldn’t do that. She’d be like Will to me. You’d tell them how to vote. Probst: Eh…Nina…it’s not happening. She’s not meant for this game long term. Nice woman, but I wouldn’t even consider aligning with her. Probst: Hey, it’s how I feel. Holmes: I like Vince. I think I could definitely work with him. Let him take the lead, hang back. “Yeah Vince, you’re right Vince.” Then I’d have to get a gauge on how potential jury members were liking him before deciding when to make a move on him. If he was rubbing people the wrong way, I’d try to take him to the end. Probst: He’s not going to be in my alliance. If I was on a tribe with him and I had to align with him, my approach would be, “Brother, just tell me what to do. You’re clearly the wise one. You’ve lived on the streets. I haven’t.” Then I’d follow his lead and hope for a switch or a merge. Shallow: Yeah, I agree. This guy reminds me of Coach so much. I would appeal to his ego. I’d fan the ego, give him a lot of praise, a lot of compliments. I’d make him feel really comfortable, like he’s running the show. And then, get rid of him whenever you need to. Probst: I would probably align with Will. And I’d make him want to please me. I’d say, “This is the way it’s going to go; my way. I know this game, you don’t. If you move left when I tell you to move right? You’re done.” And eventually I’d get rid of him because he’s super likable. Shallow: He’s really likable. But, he could also be a liability. He doesn’t seem to really know the game much. I wouldn’t get that close to him. I’d think he’d go with the last person that told him what to do. I’d make sure I was that last person he spoke with before Tribal Council. Holmes: Yeah, he’s my Edna Ma. If he’s loyal and listens, we can go a long way. If he wavers, he’s gone. I think this cast is a bunch of players and the jury will really appreciate gameplay. So, if I can get a coaster on my side, all the better for the final Tribal. One of the most exciting parts of any “Survivor” press junket is the day the press gets to participate in an immunity challenge against Jeff Probst’s beloved “Dream Team.” (Quick Note: The Dream Team is a collection of athletic young men and women who test out the challenges to make sure they’re safe, fair, and exciting.) This exhibition lets us know how grueling the challenges are, it lets us experience the stress of competing in front of a ton of people, and it gives Jeff Probst a chance to yell at us. I’ve had a blast competing in these events over the years. Mainly because the dynamic has shifted from the press being humiliated by the younger, stronger, better-looking, better-smelling Dream Team to the press actually being able to hold their own. In fact, ever since my first loss in Gabon I’ve managed to rack up an Ozzy-esque five consecutive victories. Now, you may think winning exhibition challenges in a reality show isn’t a big deal, but I fully intend to have “Five Straight Immunity Challenge Victories” inscribed on my tombstone, Royal Tenenbaum-style. All three of the tribes will sprint down a tilted runway into a pile of hay. Once they manage to free themselves from the hay, they’ll have to maneuver over a high-step obstacle. Then it gets tricky. One member from each tribe will have to release a ladder from a box. To do this, they’ll either have to untie about a jillion knots. Or, unlock three padlocks using a ring full of keys. From there, they’ll use the ladder to climb up a platform, cross to a second platform, and then climb down. Next up, they’ll have to pass the ladder through two table puzzles. A 50-Piece Puzzle – Basically a picture puzzle made of squares. A 5-Piece Puzzle – The player must use five flat shapes to create a perfect, 2-D square. The 50-piece puzzle is the easiest, but takes the longest to complete, the five piece can be done in ten seconds if you can figure out how it works, and the ten piece is somewhere in the middle. One person from each tribe will tackle the puzzle. The first tribe to complete their puzzle wins bragging rights and first dibs on sandwiches from craft services. There would only be two actual journalists competing in this little exhibition; myself and “Survivor” Hall of Famer Parvati Shallow. So, we would had to fill out the rest of our tribe ranks with Dream Teamers. But, if He-Man could partner with Skeletor to take out Hordak, I guess I could team up with my mortal enemies to take down a former “Survivor” champ. The third team would be led by Samantha, the daughter (and for this trip, the assistant) of CBS’s lovable photographer Monty Brinton. As the guy who lives behind a computer, it made sense that I’d be White Collar leader. Yoga superstar Parvati headed up the No Collar tribe. And, Samantha was Blue Collar pretty much by default. This challenge is all about choices. How do you free the ladder? Which puzzle do you choose? So, Challenge Producer John Kirhoffer insisted that Parvati, Samantha, and I do all of the tasks for our tribe. He claimed that he wanted to pick our brains afterward to see why we made our choices, but I bet he really wanted one of us to be solely responsible for our tribe’s loss. Oh good, no pressure. Everybody had a good laugh at that. Probst laughed himself, then gave me grief for not giving him a warmer welcome. I told him I was in the middle of something, but would be sure to give him a sweaty post-victory hug when I was done. Once the strategy session was over, we took our marks. Probst started the festivities with his trademark line and we were off. Now, most people simply ran down the ramp and into the hay, then stomped around to free themselves. I had a different, probably dumber strategy; I ran down the ramp, then tucked into a forward roll. Yeah, I might’ve gotten hay in every orifice in my head, but I cannonballed right through that mess and was the first one into the next obstacle. With my tribe right behind me, I was the first one through the high-step course. I went to work on the knots with a slight lead. Why did I choose the knots? Honestly, the locks scared me. I’d done really well with the knots in the Philippines and I knew no matter what I’d be able to finish. I worried that a rusty lock or a faulty key could cause some serious problems. Parvati decided to try the locks, while Stephanie took on the knots. Actually, twenty ropes of ten knots apiece for a grand total of 200 knots. No sympathy from that guy. Meanwhile, Parvati was killing the locks. In fact, she had opened all three of them and removed her ladder while I still had about ten ropes to go. To make matters worse, I looked back and Samantha had about seven ropes to go. Samantha would later tell me that she was hooking her thumbs in the ropes and pulling them apart while I had been griping the individual ropes. Samantha destroyed me. I went in a with a lead and she passed me by a significant margin. Eventually, I learned that there’s one thing worse than Jeff Probst standing over you and saying things like, “Your 401K can’t save you now, Holmes!” in front of the entire “Survivor” crew. And that’s when he has to stop making fun of you so he can rush to the end of the challenge to call Parvati and Samantha working on their puzzles. With numb fingers and a bruised ego I finally got through that 200th knot. My compassionate teammates hopped into action as we tried to salvage the challenge. We were quick to get up, across, and over the platforms. Then, as we were plowing through the two table puzzles, I noticed that the other tribes weren’t celebrating just yet. Apparently Parvati had chosen the five-piece puzzle, Samantha had chosen the ten-piece, and neither had made any significant progress. Now, I had a decision to make. Going into the challenge, I thought I’d go for the 50-piece puzzle if I had a lead. And, if I was behind I’d go for the 10-piece. Thinking of how difficult that five-piece puzzle must be completely psyched me out. I wasn’t going near that one. We quickly retrieved the ten-piece bag and I went to work. I emptied all of the pieces onto one side and one by one, rotated them around the tree-shaped frame looking for a combo that fit…and I didn’t find one. Uh oh. It was at this point that both Parvati and Samantha made the call to switch to the 50-piece puzzle. Now we’d all pretty much be starting from scratch. I kept with my strategy. Eventually it dawned on me that there was some empty space in the puzzle. Once I figured that out, it was off to the races. With each piece that I put into place, the puzzle got easier and easier. Even Probst had to admit that I was in the midst of a miracle comeback. And once that tenth and final piece was secure, I was finally able to give Probst that sweaty embrace I had promised him. And talk trash I did. As I strolled over to my press team sibling, I noticed that Samantha was getting the best of the situation. Parvati tried to ignore me, but I managed to get in her ear and convince her to switch to the ten-piece. However, by the time that bag was opened, the challenge was over and the No Collars were on the losing end. When it was all said and done, we went over our strategies and hypothesized as to which ones we thought the future players would undertake. The Dream Teamers admitted that the locks were always the way to go and that the five-piece puzzle is a nightmare if you don’t know the trick. The “Survivor” Hall of Fame is proud to have 2010 inductee Parvati Shallow as a part of the Executive Voting Committee. As a member of this exclusive committee, Parvati (along with Host Jeff Probst and other “Survivor” luminaries) will nominate her three favorite Tribal Councils. Then, from Monday, December 8, 2014 at 10 am ET through Friday December 12, 2014 at 5 pm ET, the top three Tribal Councils will be chosen by a fan vote. Note: All of the nominations were requested at the same time, so some Tribal Councils may be nominated more than once. “Survivor: Micronesia – Fans vs Favorites” – Episode 13 Tribal Council: Erik gives Natalie the immunity necklace. This moment blew my mind. I was so glad I was sitting behind Erik, and he couldn’t see my face. I think if he saw how hard my jaw hit the floor he would have changed his mind and kept his necklace. Thanks to the team of superhero women I was working with in Micronesia, this became one of the most incredible Tribal Council blindsides of all time. “Survivor: Borneo” – Final Tribal Council: Sue Hawk’s snake and rat speech. I’m throwing this one in there so they’re not all about me. 🙂 The very first season of “Survivor” rocked my world even though I didn’t see it until a week before boarding my plane to the Cook Islands. When Sue Hawk tore into the final two, describing her desire to “watch the snake eat the rat,” she spoke to the raw emotion people feel upon being voted out or betrayed. That was my first glimpse into the heavy reality of competing in the “Survivor” arena. “Survivor: Heroes vs. Villains” – Episode 6’s 1st Tribal Council: Russell gives me his idol and saves me in “Heroes vs Villains” and Tyson votes himself out. I knew I was in trouble at this Tribal Council. I also did not know that Russell was prepared to generously sacrifice his own safety in the game for me. In the moment, it was all a blur. But, when the dust settled and I was eating hot dogs on the other side, I was ecstatic. This move was a huge risk for Russell, and it paid off HUGE by granting us both the opportunity to fight all the way to the end. Follow the “Survivor” Hall of Fame on Twitter and Facebook for up-to-the-minute updates and Tribal Council nominations. There was no time for gloating after my Redemption Island triumph as I was immediately tossed into a van and carted off to the traditional Dream Team vs. Press Members immunity challenge run. Note: The Dream Team is a group of production assistants who test out all of the challenges. Basically it’s the best summer job you can ever have. However, because of the large amount of press at this season’s junket, we weren’t able to do a straight-up press vs. Dream Team challenge. So, we ended up with two Dream Teamers on our side and two Dream Teamers on the opposing side. The challenge shakes out like this; one unfortunate tribe member will cram his or herself into a tiny barrel that wreaks of glue. Then, three of his or her tribemates, who are attached at the waist, will roll the barrel up and into a special barrel-shaped cradle. The barrel dweller will then hop out, climb onto the barrel, and untie a bag of balls. From there, Mr. or Mrs. Unlucky will hop back into their barrel. The rollers will back the barrel out of the cradle, proceed to the next stand and continue the ball-retrieving process. There are four cradles in all and they are arranged in a zig-zag pattern along the course. Needless to say, this could cause some barrel-related collisions. Once all four bags have been retrieved, the barrel will be rolled into a final cradle and the inhabitant will burst forth to present the rest of the tribe with his or her bounty. The four remaining players will then roll the balls up a skee-ball-esque structure. The first tribe to land six balls in place wins immunity and the adoration of everyone in attendance. When given the choice of Dream Team members, I was quick to choose my nemesis from the Redemption Island challenge, Andrew. I knew he had the goods. Our second pick was much more strategic as we went with Dexter, the smallest Dream Teamer available (some might even call him barrel-sized). The rest of my team was made up of “Survivor” Hall of Fame executive committee voters Dalton Ross, Dru Moorhouse, Shawna Malcom, Mara Reinstein and “Survivor” Hall of Fame Inductee Parvati Shallow. “Team Survivor Hall of Fame” might not have been the most clever name, but that’s what we went with anyways. We did some quick strategizing and decided that a trio of myself, Dalton, and Parvati handling the barrel pushing was the best way to go. I think our logic was that because Dalton and I are similar heights and Parvati is slightly shorter, that somehow our reach would match the contour of the barrel. Meh…it sounds kind of ridiculous now, but it made sense at the time. Dexter hopped into the barrel and we were off. When we hit the first cradle, we had some trouble going straight up the ramp, so Dalton and I just lifted it up and plopped it into place. Illegal? Maybe. But, nobody said we couldn’t. Dexter popped out of the barrel and quickly went to work. We steadied him on the barrel while he attacked the knots and retrieved our first bag. Quick Aside: Dexter is a champ. It was a billion degrees out there and that barrel stunk. We were able to complete the rest of the course ahead of our opponents utilizing a mixture of Dexter’s agility and the quasi-legal lift-and-drop method. The other tribe was game and even managed to take the lead at one point, but our ball rollers were able to come back and win it. Team “Survivor” Hall of Fame had lived up to their name. And having completed two challenges in the scorching sun in less than two hours, I finally had time for the gloating I’d missed out on earlier. But, I went for a nap instead. Don’t miss the special 90-minute premiere of “Survivor: Blood vs. Water” on Wednesday, September 18, 2013 at 8 p.m. ET. Some quick reminders/orders of business, etc. First, if you don’t want to know who wins “Survivor: Cook Islands,” this isn’t the place for you. There WILL be spoilers. Go watch “Survivor: The Amazon” instead. Second, speaking of “Survivor: The Amazon,” Mr. 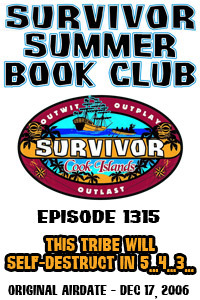 Rob Cesternino is very generously offering his “Survivor: The Amazon – Unauthorized DVD Commentary” at an exclusive DISCOUNTED RATE for Summer Book Club members. Third, our friends at True Dork Times are once again getting in on the fun with stats, awards, and more. And finally, this whole Book Club thing is kind of a work in progress. If you have ideas on how to improve the proceedings, please let me know. My Big Question: Parvati Shallow, “Boston” Rob Mariano, Russell Hantz, Richard Hatch, Sandra Diaz-Twine, Ozzy Lusth, Cirie Fields, Tom Westman, Amanda Kimmel, Rob Cesternino, and Ethan Zohn. That’s the full roster of“Survivor” Hall of Famers. All eleven have appeared on the show more than once. Whenever the topic of worthy one-timers comes up, Cook Islands champ (spoiler alert!) Yul Kwon is always a popular pick. However, many seem to think his (spoiler alert!) over-powered immunity idol should count against him. With this re-watch, I hope to get to the bottom of that mystery.